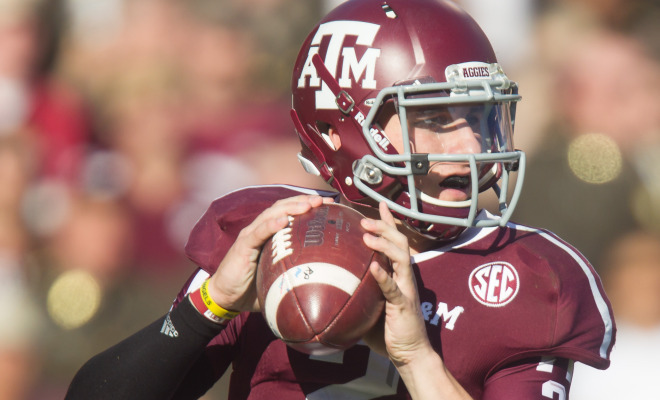 In addition to winning the Davey O’Brien Award, Johnny Manziel of Texas A&M was awarded the Heisman Trophy and was named a first-team All-American by the Associated Press (AP), Football Writers Association of America, Walter Camp Football Foundation, Sporting News, ESPN, CBS Sports, Scout.com, and Sports Illustrated. He was also named Player of the Year by the AP and Sporting News, while the SEC honored him as Offensive Player of the Year. He had a record-setting season as a freshman, passing for 3,706 yards and rushing for 1,410 yards, becoming just the fifth NCAA Football Bowl Subdivision player and first freshman to throw for 3,000 yards and rush for 1,000 yards in the same season. He finished the season ranked first in the nation in total offense (393.54 yards) and points responsible for (21.69 points per game). Manziel also led the SEC with 1,410 rushing yards and 47 total touchdowns while setting the conference record for total yards in a season with 5,116. He was selected in the first round of the 2014 NFL Draft by the Cleveland Browns.